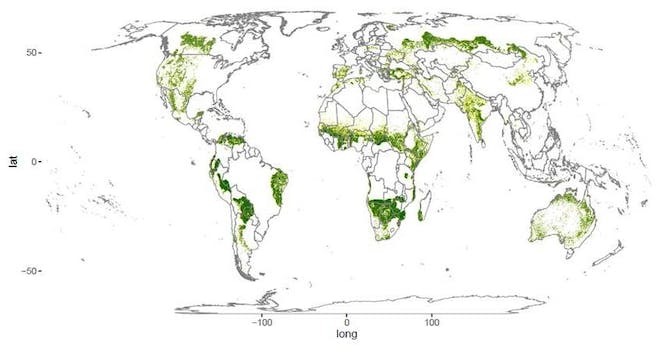 A new global analysis of the distribution of forests and woodlands has 'found' 467 million hectares of previously unreported forest – an area equivalent to 60 percent of the size of Australia. The new forests were found by surveying 'drylands' – so called because they receive much less water in precipitation than they lose through evaporation and plant transpiration. As we and our colleagues report today in the journal Science, these drylands contain 45 percent more forest than has been found in previous surveys. What's more, previous surveys were based on older, low-resolution satellite images that did not include ground validation. Given that drylands – which make up about 40 percent of Earth's land surface – have more capacity to support trees and forest than we previously realised, we have a unique chance to combat climate change by conserving these previously unappreciated forests. Climate models suggest that dryland biomes could expand by 11 to 23 percent by the end of the this century, meaning they could cover more than half of Earth's land surface. The discovery will dramatically improve the accuracy of models used to calculate how much carbon is stored in Earth's landscapes. The research was carried out by researchers from 14 organisations around the world, as part of the UN Food and Agriculture Organisation's Global Forest Survey. Andrew Lowe, Professor of Plant Conservation Biology, University of Adelaide and Ben Sparrow, Associate professor and Director - TERN AusPlots and Eco-informatics, University of Adelaide.